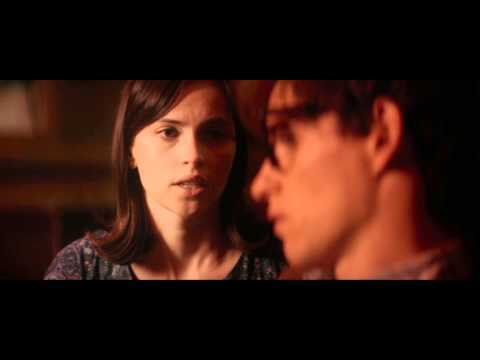 "The Theory of Everything" movie quotes tell the true story of when Stephen Hawking met his first wife Jane, fell in love and dealt with a devastating medical condition. The biographical film, which was based on Jane Hawking's memoir, Travelling to Infinity: My Life with Stephen, was written by Anthony McCarten and directed by James Marsh. "The Theory of Everything" opened in theaters in the United States on November 7, 2014. In "The Theory of Everything," Stephen Hawking (Eddie Redmayne) is a young doctoral student at Cambridge University pursuing a PhD in psychics. He meets Jane Wilde (Felicity Jones) and instantly the two students hit it off. But while Stephen discusses his research on space and time, he experiences increasing issues with his motor skills, leading to a fall, a hospitalization and a devastating diagnosis of a motor neuron disease. Though Stephen is told he has just two years to live and wants to focus on his research, Jane is set on sticking by his side through thick and thin. What follows is the story of their love, Stephen's research and their perseverance against adversity. "The Theory of Everything" joins a bunch of other great films in theaters such as "Interstellar," "Nightcrawler," "Big Hero 6," "Before I Go to Sleep," "Horns," "John Wick," "White Bird in a Blizzard," "Fury," "The Best of Me," "The Book of Life," "Birdman or (The Unexpected Virtue of Ignorance)," "The Judge," "Alexander and the Terrible, Horrible, No Good, Very Bad Day," "St. Vincent," "Gone Girl," "Men, Women & Children," "Left Behind," "The Equalizer," "Pride," "Good People," "The Boxtrolls," and "This is Where I Leave You." Stephen Hawking: "I'm a cosmologist." Stephen Hawking: "I study the marriage of space and time." Stephen and Jane meet at Cambridge where both are studying. Little does Jane know at that time that the perfect couple she talks of soon will be her and Stephen. Frank Hawking: "You can't realize what lies ahead. This is going to be a very heavy defeat." Jane: "I know what you think, that I don't look like a terribly strong person, but I love him and he loves me. We're going to fight this illness together." Stephen's father, Frank, advises Jane against pursuing a relationship with Stephen in his terminal state. She is not deterred, citing love as the cure to all ailments. Stephen Hawking: [via computer] "There should be no boundaries to human endeavor. However bad life may seem, where there is life, there is hope." Despite his struggles in life, his battle with a motor neuron disease, Stephen keeps a positive attitude on life. He never let the diagnosis he received in college that he had two years to live discourage him from anything in life, optimism included. Stephen Hawking: "The universe is expanding. If you reverse time, then the universe is getting smaller." Stephen Hawking: "What if I reversed the process all the way back to see what happened at the beginning of time itself?" Jane: "Wind back the clock"
Stephen Hawking: "Wind back the clock until you get a universe born from a black hole exploding." Stephen shares his theories on time and space with new love Jane. This yearning to study the beginning of time will soon lead him to ground-breaking theories on the subject.